pg172 top: The Masterpieces from oversea Ma.K. 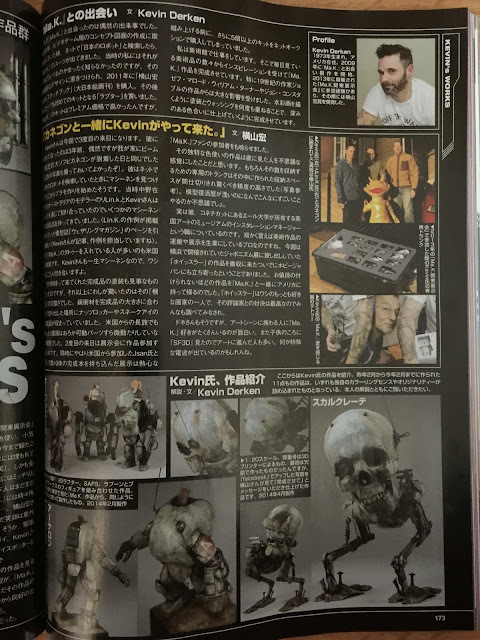 Modeller title: kevin's works introduction: The corner introducing the "Ma.K Modeler" who is supporting the Ma.K scene is becoming a regular corner and this is the sixth issue. Let's change a bit this time for oversea. 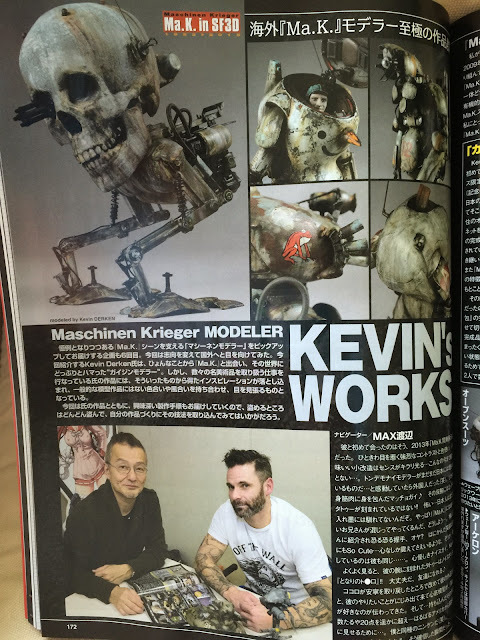 Kevin Derken, the "Gaijin (foreigner) Modeler" we are going to introduce met Ma.K from a strange occasion, and then Ma.K stormed his world. His occupation was handling lots of art pieces and his own works are being inspired and were different from o0rdinary models a lot from color or style and beame stylish that you can't take your eyes off. This time we bring with you his work and we introduce his complicated yet interesting skills together, feel free to steal as much as you can and merge it into your style! 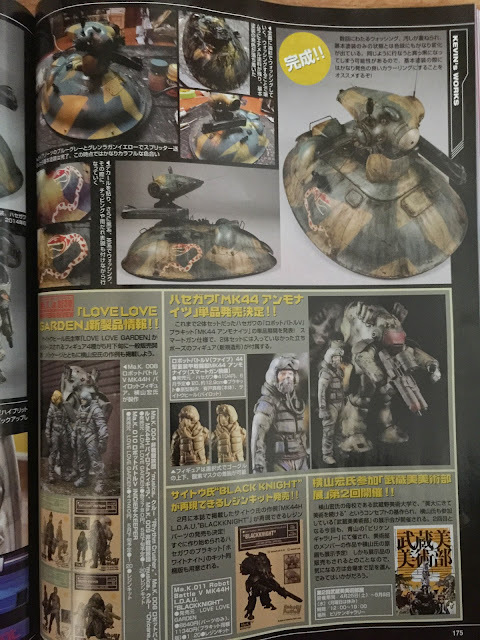 navigator/ MAX Watanabe The first time I met him is the Ma.K Kanto Convention (event name, NOT ACCURATE translated may be) in 2013. The attractive contrast (what kind of contrast was not mentioned) and use of colors, the sense he did the small conversions shined, which is something I have never seen. 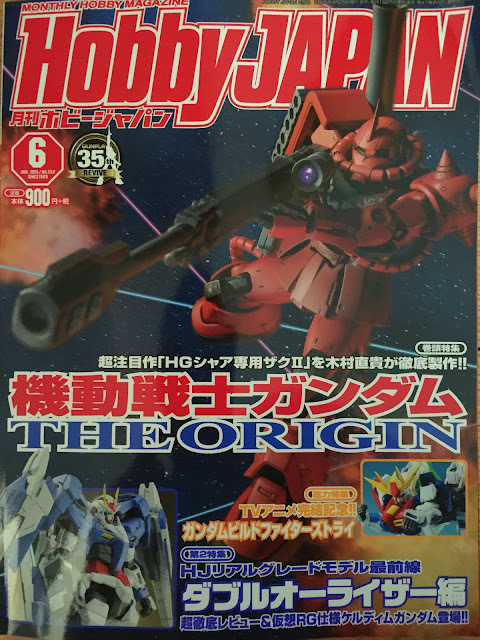 How come this awesome modeller is still hiding in somewhere in Japan? When I felt amazed I came up to the truth that this is a foreigner LOL, and he is a macho man covered with muscles! And got loads of tattoo on his both arms! Gosh it's horrible that Japanese are still not quite get used to tattoos. There were times that these horrible guys where presenting in Ma.K events, what should I do? When Mr. Yokoyama introduced him to me, huh? His shy smile is so cute, when I was still trembling I found that he felt the same! What a gengle nice guy Kevin! When I look clearly I found that it;s Neuspotter and Tonari no Totoro!! OH it's OK Kevin boy! When I was calmed down I looked at his works. I felt that he has done what he wanted to deliver from the bottom of his heart, and I felt his passion to Machinen Krieger. Also he brought over 20 model with him just for showing to other fans like him from the US, he was the same guys as me! LOL I can be friends with him, I realized at that moment. pg. 173 How I Met "Ma.K/Kevin Derken How I met "Ma.K" is quite random. In 2009 I wanted to create some concert art for video game, I searched Japanese Robot on the internet and Ma.K suits just appeared in front of me. I didn't know what is that at that moment, but I found that I was addicted to that organic design, and I purchased "Kow Yokoyama Ma.K Sketch Book" in 2011. And then I bought Raptor as my first kit. Ma.K is quite pricey comparing to other models but I still bought 5 more from the Internet auction before I assemble my first Raptor. I work in the museum, and I saw loads of art pieces and I got inspirations to build myt Ma.K models. I like J.M.W. Turner from the 19th century and John Constable and they influenced me greatly. I paint as if I am using water color and I wash repeatedly to create colors with depth on my works. profile: Kevin Derken Born in 1973, lives in America, first met Ma.K and made it in 2009. Participated in Ma.K Kanto Convention (not accurately translated please check the correct event name) and won the Kow Yokoyama Award. Introduction of Kevin's works/Kevin Derken From now on we will introduce his works, from last Feburary to the Feburary of 2015 he created 11 pieces. Those were filled with his unique coloring sense and originality. Please check his own description. Open suit 1:20 Raptor by wave, SAFS, Rapoon and figure from Brick works. I made them after I had seen some of the works in Tokyo in 2013. Made in February of 2014. Archeron 1:20 Archeron by Wave. The head cover was removed and glued. Made in February of 2014. Skull Krote 1:20. The skull was 3D printed. At first I made it just for fun but when I uploaded the photo to facebook Mr. Yokoyama encouraged me to finish it so I made this. April 2014. Pak Krote Inspired by the backrote in the book "Max Watanabe loves Ma.K vol.2". The part of it was 3D printed. April of 2014. Oscar Kit by Modelcasten. Color referenced from the German Panzer of WWII. Decal of snake was from the Kroserfoot and kuglove by Hasegawa. June 2014. Grosserhund and Nixie Grosserhund was from Hasegawa and Nixie was the resin kit from drunk dog. Inspired by "Kow Yokoyama modelling book". February 2015. Seapig 1:20 seapig by wave. Weathering referenced and imagined by the pic of astronauts of NASA. December of 2014. Snowman Kit by wave. Hair spray chipped with Tamiya Acrylic. January 2015. How the Gaijin Modeller made the Oscar! Kevin's works are inspired by the painting of 19th century and created with techniques of 21st century. Here is the making of The 1:20 Oscar by Modelcasten. Top left The body of Oscar by Modelcasten was in a vacuum form which is not that durable so I strengthened by putty. Right The base of the kit has no detail designed. So I made some by 3D printing. Referenced by the parts of 1:35 Nutrocker by Hasegawa I measured and output by 3D printer. Like the skull krote I used 3D printing. Left When it was stocked on the base it gave the Oscar a floating look. 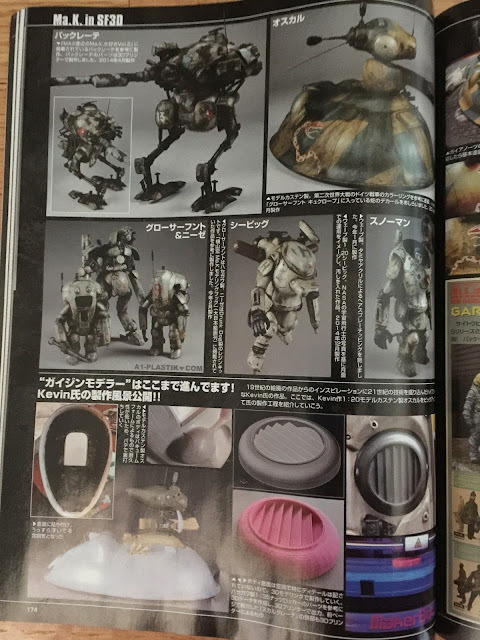 Last page Top left The sprinter camo was Blue Grey of Gaia plus gurren lagann yellow. The basic coloring at this moment is still quite colorful. Middle top Washed thoroughly by oil paint. The leftover stroke by washing was enhanced with enamel to darken the color tone. Bottom left Decal applied and washed by black and brown series of colors. After that chipping and rain effect was added. Finished! After repeated washing and weathering, the color stacked made it much different from the basic color at the very beginning. Since doing weathering repeatedly it can make it become darken and even black, so using bright color tones for base color is highly recommended!